Posted in Events and tagged L'Occitane on 10/05/2017 . 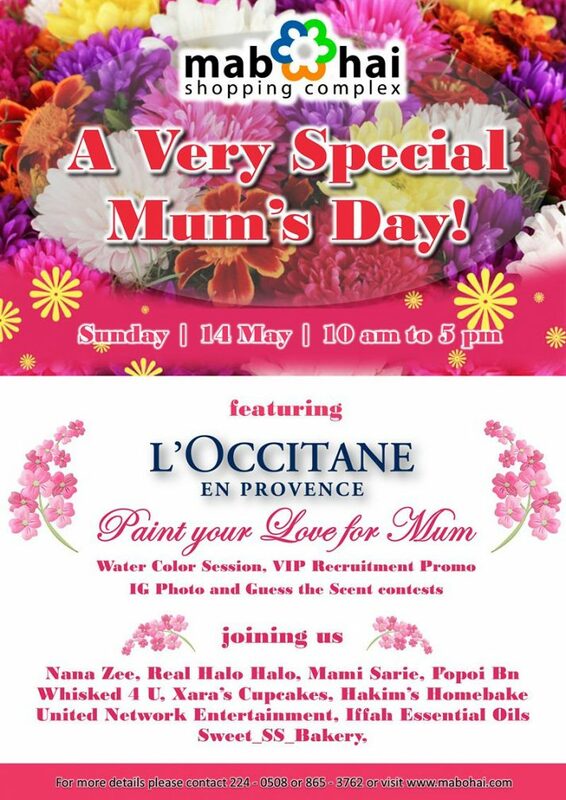 Its a Very Special Mum’s Day this coming Sunday, 14 May as we celebrate our beloved Mums day with our friends and loved ones. L’Occitane joins the celebration with their special Mum’s Day themed activity – Paint Your Love for Mum. Shoppers get to shop for something special to give to mum and at the same time give her a gift that is your very own artistic creation. More activities include an IG Photo and Guess the Scent Contests, Special VIP membership promotion and gift packs that can be bought for your special loved ones. Joining the fun will be Hakim’s Homebake with their Cupcake Decorating Activity, Nana Zee and her fabulous Henna artworks, Mami Sarie, Popoi Bn, Whisked 4 U, United Network Entertainment, Xara’s Cupcakes and Real Halo Halo and Waffles. See you this Sunday, 14 May from 10 am to 5 pm at Mabohai Shopping Complex.